The SmartVote feature lets your users rank ideas against each other so you can find out which ones consistently come out on top. 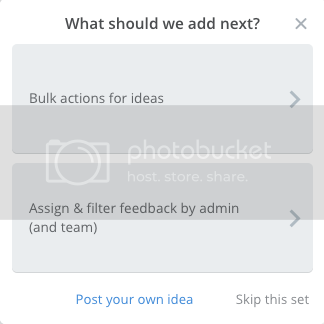 The SmartVote widget shows users a set of two ideas and asks them to choose which idea they want you to build next. When a user picks an idea, they can choose to just "pick" it or they can "pick+subscribe" which subscribes them to updates. You can also auto-prompt users for SmartVote, so you can engage your more silent users that have valuable feedback to share, but might not post on your forum. Learn more about the logic behind SmartVote polls here. To get started with SmartVote, you need to choose which ideas you want to be tested in SmartVote. This is called a poll. SmartVote can only be used with ideas on public forums. Enter a name for your poll and click "Create"
Use the search box to select the suggestions you want to add to the poll or click to "Create new suggestion". Click the blue "Add to Poll" button to add an idea to the SmartVote Poll. You can also add ideas when viewing them in the forum. When you're viewing an idea, click the "SmartVote" Tab. You'll be able to see if it's already in a SmartVote poll and click the option to add it to one. You can add new ideas at any time, but each time you add ideas, it will increase the amount of time the poll needs to run to get results. Polls are specific to forums, and you can run multiple polls at once. If you are running more than one poll on a forum, it will cycle through the ideas from different polls when a user uses SmartVote. So it may test ideas from 3 different polls, but the ideas will only be tested against ideas within the same poll. If a user has gone through all of the polls for that forum, the widget will default to "Post an Idea." Auto-Prompts: If you enable auto-prompts, users will be prompted after 7 days of activity, and every 6 weeks after that. Add the widget code to your website. We recommend adding the code right before the final </body> tag. For more details on how to add the widget code to your site, check out this article. Setting the Forum: The SmartVote widget can only pull ideas from one forum. By default, it pulls from the default forum in your feedback settings, but you can set a different forum in the widget code with forum_id: 'xxxxx' (the ID of the forum you want to use). To turn auto-prompts off and on go to Settings -> Widgets -> Scroll down to "Autoprompts" and click "Edit." For auto-prompts to work you have to use our .identify feature. This is required so we ensure we don't auto-prompt a user too often. Post an Idea: The SmartVote widget is smart. If a specific user has already cycled through all the polls for your forum and "picked," it will default to post an idea. You can enable SmartVote on your UserVoice web portal for end users as well. Go to Settings -> Web Portal -> Click "Edit" for "Appearance and Features." Under "Site Sections" you'll see the option to enable "SmartVote" for the Forums. Q: How does the SmartVote algorithm work? Q: I can't get SmartVote set up for my forum? A: Ensure the forum is not private. SmartVote does not currently work with private forums. If you want to see this functionality, support this idea on our forum. Q: Where do I view my SmartVote results? A: This article walks through the basics of the report.